The definitive Whiskey SSG was Project 665/Whiskey Long-Bin, the term referring to the enlarged fairwater configured with four forward-firing Shaddock launch tubes. Six of these submarines were produced, their significance soon being overshadowed by the large Soviet SSGN program. The Project 644/Whiskey Twin-Cylinder marked the first operational deployment of the Shaddock missile system. The paired canisters elevated to fire aft. The Whiskey-class submarines served as test and operational platforms for several missile systems. Note the blast shields at the forward end of the canisters. 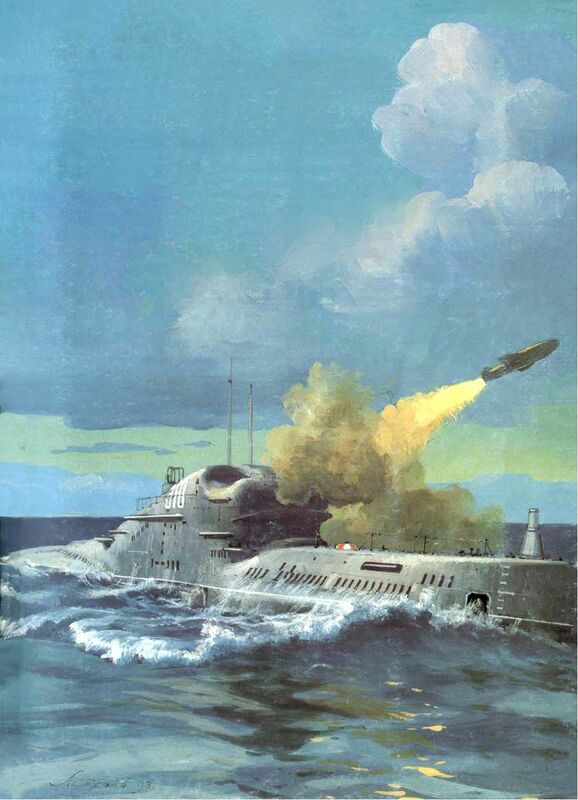 Whereas the U. S. Navy initially developed submarine-launched cruise missiles for strategic attack and then shifted to ballistic missiles for the strategic role, the Soviet Navy displayed continuous interest in both types of missiles for the strategic role. The USSR was not the target of German V-1 cruise missiles. 23 In July 1944, however, Great Britain provided a damaged V-1 to the Soviet Union and by the end of the war, work was under way on cruise missiles at the aircraft design bureaus headed by Georgi M. Beriev, Vladimir N. Chelomei, Sergei V. Ilyushin, and Seymon A. Lavochkin. Chelomei would be the most successful in developing ship-launched cruise missiles. 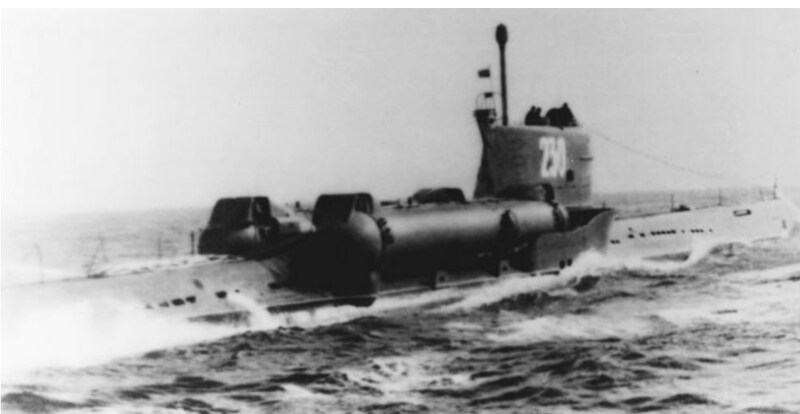 In 1952-1953 design efforts began on Project 628, an updated Soviet XIV series (K-class) submarine configured to conduct experimental launches of the 10XN Volna (wave) subsonic cruise missile. This missile-developed by Chelomei’s design bureau-was powered by twin ramjets; the missile was launched from a ramp with the aid of a single booster rocket. Although Western intelligence reported launchers installed near Leningrad and Vladivostok for this missile, it did not enter ground or naval service. It was rejected for naval service because of guidance limitations, the high fuel consumption of available ramjets, and the ongoing development of supersonic missiles. (A version of the 10XN did enter service with the Soviet Air Forces in 1953.) A still further refinement of the V-1 design by Chelomei was the 15X missile, based on the availability of the Rolls-Royce Nene centrifugal-flow turbojet, provided by Britain’s Labour government for civil use [that went well!] in the Soviet Union. This engine, which also became the powerplant for the famed MiG-15 turbojet fighter, and an advanced point-to-point guidance system gave promise of an effective submarine-launched strategic weapon. The submarine would transit to a preselected launch position with the missile either in a towed launch container or fitted in a container on the deck of the submarine. The former concept had been developed by the Germans to tow V-2 ballistic missiles to an underwater launch position. Chelomei’s design bureau was disestablished in December 1952 because of political intrigues within the defense industry. The decree closing Chemomei’s bureau was one of the last such documents signed by Josef Stalin, who died in March 1953. Chelomei’s facilities were taken over by aircraft designer Artyem I. Mikoyan. From January 1953, as a professor at the Bauman Institute of the Moscow Technical University, Chelomei continued to work on missile designs. In 1954 he conceived the idea of ship launched missiles with wings that automatically extend in flight. This would permit the missiles to be carried in containers essentially the same size as the missile’s fuselage. Aerodynamic improvements made possible the elimination of a launch ramp, permitting the missile to be launched directly from the canister. He applied this concept to the 20X missile which, upon provision of more-flexible guidance, become the P-5 (NATO SS-N-3c Shaddock26). This deck-mounted canister would be adopted by the Soviet Navy, with the structure providing both the storage and launch functions, simplifying installation in surface ships as well as in submarines. This was in contrast to the U. S. Navy’s method, which employed the canister as only a hangar, with the missile having to be manually extracted, placed on launch rails, wings extended, and other manual functions performed before launching. Chelomei gained the support of Soviet leader Nikita S. Khrushchev. In August 1955 his design bureau was re-established as OKB-52, initially to develop submarine-launched cruise missiles. That year the decision was made to produce both the P-5/Shaddock cruise missile of Chelomei and the P-10 cruise missile being developed by OKB-48 under seaplane designer Beriev. Both missiles were intended for strategic strikes against land targets. A single Project 611/Zulu design was modified in 1955 to the Project P-611 configuration to test launch the P-10 missile. The P-10 was housed in a hangar, with the missile extracted from the hangar, its wings opened, and then launched (as with the U. S. Regulus). The hangar was on the deck casing, aft of the conning tower, with the missile to fire forward, over the bow. The submarine was modified at Molotovsk shipyard (subsequently renamed Severodvinsk). During the fall of 1957 four P-10 missiles were launched from the submarine P-611. But work on this missile was halted because of the successful tests of the P-5 missile, which was supersonic (Mach 1.2), had a range of 300 n. miles (570 km), and incorporated other advantages when compared to the P-10 missile. In that same year, Project P-613-the modification of the Project 613/Whiskey submarine S-146- was undertaken to conduct tests of the P-5 missile. That modification, like the P-611, was under chief designer Pavel P. Pustintsev of TsKB-18. The work was undertaken at the Krasnoye Sovormo yard in Gor’kiy, inland on the Volga River. The missile canister for this submarine was also placed behind the conning tower and, again, the launch took place on the surface, over the bow. Following P-5/Shaddock tests at Kapustin Yar in 1956, the first P-5 missile was launched from the S-146 on 22 November 1957 in the White Sea. After extensive tests the P-5 system became operational in 1959 and was installed in operational submarines. Work on competing anti-ship cruise missiles was halted. 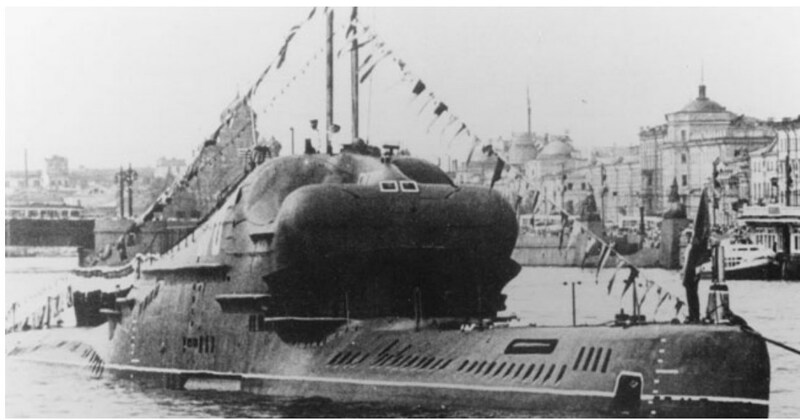 Six Project 644/Whiskey Twin-Cylinder submarines were converted in 1960 at Gor’kiy to a Pustintsev design. Each submarine was fitted with paired missile canisters aft of the conning tower, built into the deck casing, which elevated and fired aft, over the stern. Simultaneous with this effort, guided missile submarine Project 646 was developed on the basis of Project 641/Foxtrot. Another design effort of Pustintsev, this craft had a submerged displacement of approximately 3,625 tons and featured several major variants: the basic design was to carry four P-5 missiles or two P-10 missiles; the improved Project 644P had two P-5 missiles. However, further development of these designs was not pursued. Instead, the definitive Project 613/Whiskey SSG design was Project 665, known by NATO as the Whiskey Long-Bin (for the enlarged conning tower structure). These were new-construction submarines of a design developed by TsKB-112 under designer B. A. Lyeontyev. Each had four forward-firing P-5/ Shaddock missiles installed in the front portion of the large, bulbous conning tower. The launch tubes were fixed at an upward angle of 14 degrees. From 1961 to 1963 the Gor’kiy yard and the Baltic shipyard in Leningrad together delivered six Long-Bin submarines. The P-5/Shaddock land attack missile had a range of 300 n. miles (550 km), a terminal speed of Mach 1.2, and an accuracy of plus-or-minus two n. miles (four km). While limited in missile range and effectiveness, these submarines provided the Soviet Navy with valuable experience and training in cruise missile submarines. 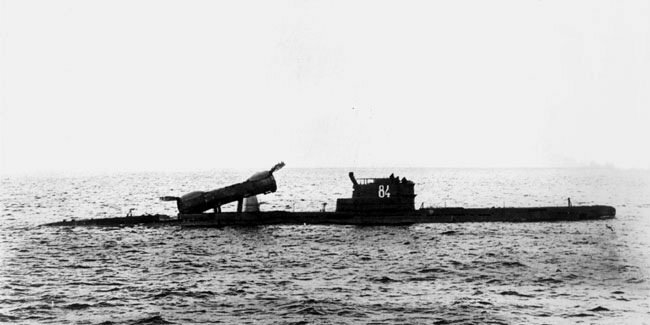 Unlike the two converted fleet boats used by the U. S. Navy in the Regulus program (Barbero and Tunny), the Soviet Project 665 submarines did not undertake long-distance missile patrols.